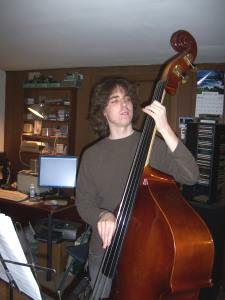 Bill Jones is a former bass/guitar student of mine who is now a Music major at Lehigh University. He was always interested in music theory. He was up to Jimmero Studio over Christmas break to put together a couple three songs. He plays upright bass which is featured on a cover of 'Love Theme'. His 2 original works 'Intro to Love' and 'Motivation' are amazing! He will back in the studio in the spring and look for some recordings of his band soon. "Jimmy Ro's musical and technological knowledge, combined with his commitment and general integrity, yield a professional product that does not compromise the artist's intent in the least bit. He will go without sleep until you're are happy with the result. "